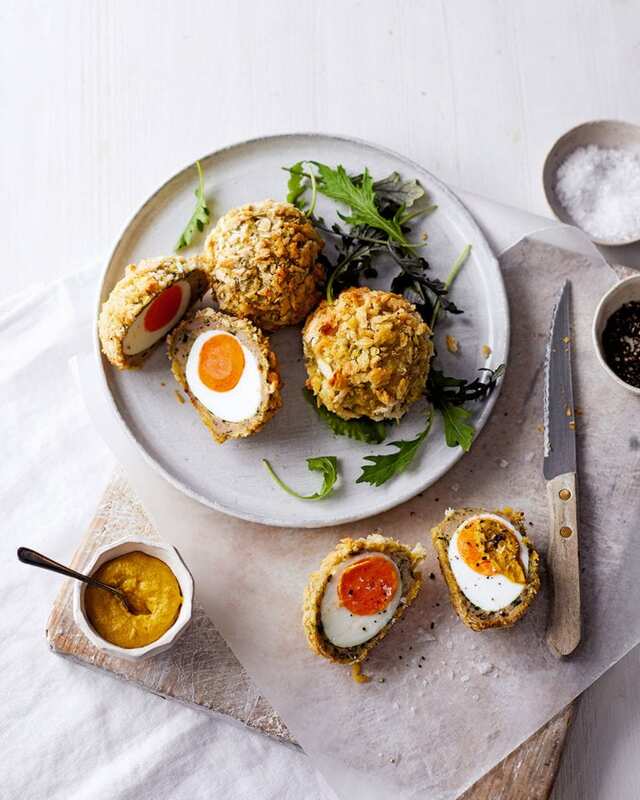 We’ve made the popular scotch egg recipe much healthier than the classic version by baking them, instead of deep-frying in oil. Heat the oven to 200°C/180°C fan/gas 6. Put the eggs in a large pan of boiling water and boil for 6 minutes exactly. Drain, cool under running cold water, then shell. Meanwhile, combine the turkey mince, allspice, coriander and spring onions in a bowl, then season. Divide the mince into 6 equal balls, then flatten each to a disc in the palm of your hand. Put a cooled egg in the middle, then use your other hand to mould the meat around the egg, completely enclosing it. Shape into a ball and set aside. Repeat with the remaining eggs and meat portions. Put the flour, beaten eggs and breadcrumbs in separate shallow bowls. Dust a scotch egg with a little flour, then toss between your hands to remove any excess. Dip into the beaten egg, shaking off any excess, then roll in the breadcrumbs. Set aside, then repeat with the other scotch eggs (see Make Ahead). Spray the scotch eggs all over with cooking oil. Bake on a baking tray lined with non-stick baking paper for 20 minutes until lightly golden. Serve warm with mustard and salad, or cool completely and chill to eat as a cold snack (see Make Ahead). Cool the baked eggs, then cover and store in the fridge for up to 3 days. We swapped sausagemeat for turkey thigh mince to reduce the fat. Instead of deep frying the scotch eggs we baked them, which reduces oil content. It also allows you to use fewer breadcrumbs for the coating.